Lockheed Martin is to assist Ocean Power Technologies (OPT) with the design and manufacturing of a proposed commercial-scale wave power generation project in Oregon, US. The two companies have agreed to collaborate on the project, which will form a key part of plans by OPT to commercialise its PowerBuoy wave power device. Lockheed Martin is to provide design, manufacturing, system integration and supply chain management expertise to help OPT progress its PowerBuoy technology. The wave power station will be built in Reedsport and will feature ten 150kW PowerBuoy devices. 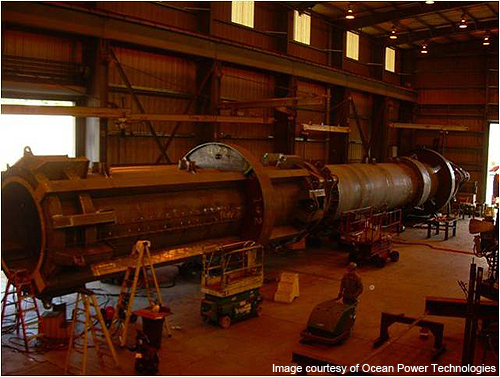 Experience with the 15 kW wave power generator will help OPT to develop its next-generation, 500 kW device. The project has already won financial backing from the US Department of Energy (DOE). "With the Department of Energy's continued support and Lockheed Martin's expertise, the commercialization of our technologies to harness wave power continues to make steady progress," said Charles F. Dunleavy, chief executive officer of OPT. Construction of the Oregon PB150 PowerBuoy's steel structure has been completed, and testing of the advanced power take-off and control system is underway, according to OPT. Assembly, systems integration, and land testing of the PowerBuoy is planned to occur over the next several months.